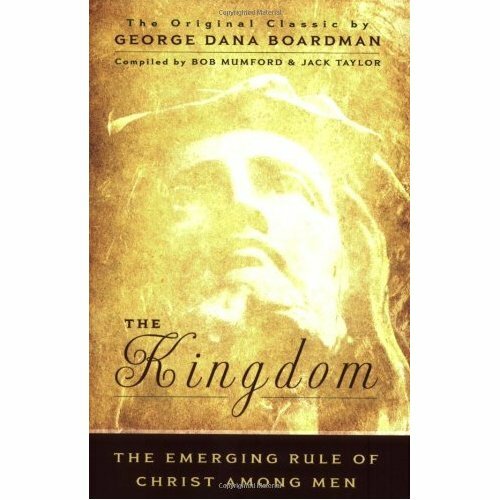 George Dana Boardman, the stepson of Adoniram Judson and long-time pastor of First Baptist Church Philadelphia (1864-1894), has written a book that has quickly gone up my top-ten list of the greatest Christian books of all time. The Kingdom: The Emerging Rule of Christ Among Men is a book that confirms what I have long believed the Bible to teach about the Kingdom of God. Since I was a boy memorizing Romans, studying theology, and reading Christian books vociferously, I have sought to find a book that systemized the teaching of Scriptures regarding Christ's words "Repent, for the Kingdom of God is at hand." Boardman's book does an excellent job of expounding the meaning of Christ's statement. The word "kingdom" (basilia) is used one hundred and forty times in the New Testament. 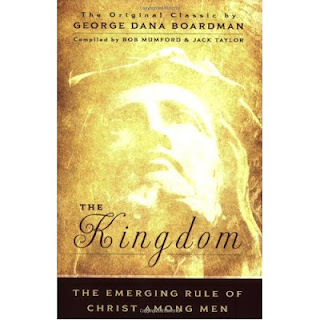 Boardman shows, quite convincingly, how the Kingdom of God is God's reign in man's heart through Jesus Christ. Further, he brilliantly proves that when the Kingdom of God comes, there is not a grim assent to the dominion of God over the sinner, but a willing consent to the dominion of God within the sinner. The implication of this profound truth of kingdom living is that the gospel (evangelium) is more than just faith in the atonement at the cross. Faith in the gospel becomes the life of God in the soul of man to produce the rule of God in the life of man. "Thy Kingdom come" ... is a prayer requesting that what is pleasant and pleasing in heaven become pleasant and pleasing in my life. Thanks to my friends Jack Taylor and Bob Mumford for republishing Boardman's classic book and my Enid friend Rob Cummins for purchasing it for me. Boardman's excellent treatise will have a lasting and powerful impact on my life and ministry. Outside of the Shepherding movement many years ago, I have gained much for the teachings of Bob Mumford. Further, he brilliantly proves that when the Kingdom of God comes, there is not a grim assent to the dominion of God over the sinner, but a willing consent to the dominion of God within the sinner. Wow! Love this! That's why Jesus offered His yoke...because His burden is light; not difficult once we are born of the Spirit. I've thought for some time that the elements of a kingdom are; (A)The King, and (B)The Subjects. So, in the microcosm, one subject is enough to have a kingdom. And, in view of the fact the Lord said that those who give up houses or lands for His names' sake will inherit a hundredfold, I'm guessing those aren't essential in the Kingdom, either. While I read many translations, and have collect a small number of basic reference books, I am ever deeply dependent on my first red letter King James. When I do not completely understand Scriptures (New & Old) I simple return to the basics of how I began my discipleship with Jesus. I read the red letters over and over and over because I so badly wanted to really know Him, to hear His voice. This practice led me to have a curiousness about The Kingdom many years ago, so I used the Strong's and not only read all of the New Testament references to it, but I wrote them out as I went. Such revelation in this basic and simple practice! It led to a whole new level of repentance and revival. I am going to order this book, I could use a little revival!! Your posts are very good food, grateful sir to you. Wade - Grateful for your thoughtful and passionate heart which comes through with your blog-posts. Came across you blog a few years back during the Ergun Caner debacle -- and so glad I did. Your blog is now part of my regular reading and I am blessed for it. OK, now to my comment...I am curious if you have ever read "Follow Me: Experience the Loving Leadership of Jesus" which is a wonderful book on the Kingdom written by pastor Jan David Hettinga and was published by NavPress in the mid 1990s. If you do ever read this book, would love to hear your thoughts about it. BTW, one of the best illustrated books I've ever seen, and quite good. Thanks again for your excellent blog, it is a blessing. I have never read it! I will see about picking up a copy. Yes. Jesus told us to go and preach the gospel of the Kingdom, and, yes, it is Christ's reign in us. I have found NT Wright's and Dallas Willard's writings on this subject to be excellent. A.B. Simpson and A. W. Tozer come to my mind as good reads on the topic. "Bonhoeffer takes the beatitudes seriously. There is one place where the beatitudes are incarnate in one Person — the Crucified of Golgotha. Thus the disciples, following their Lord, are called 'blessed' because they have obeyed the call of Jesus. The poor in spirit are those who have accepted the loss of all things including their own selves for His sake. Those who mourn are those who do "without what the world calls peace and prosperity." Mourning means to refuse to be in harmony with the standards of the world. The meek are those who give up claims to their own rights for the will of Christ. Those who hunger and thirst for righteousness are those renouncing all claims to personal achievement, who wait for God’s reign of righteousness. The merciful, having given up claims to their own dignity, become "men for others," helping the needy, sick, castouts — all those who need any kind of ministry. The pure in heart become that way by giving their hearts completely to the reign of Jesus. Under His rule, He purifies their hearts with His Word. The peacemakers renounce all violence and "maintain fellowship where others would break it off." but God’s Kingdom belongs to them. To this motley crew the world says "Away with them" and God agrees with the world. But He intends them for the Kingdom of Heaven, where their reward is great."